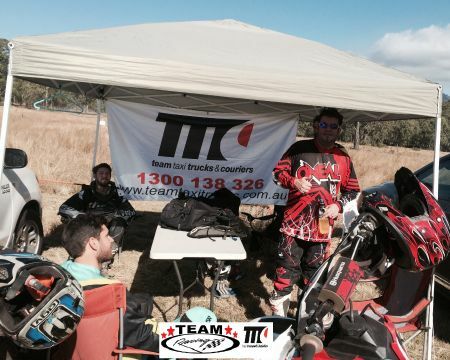 Proudly supporting our motocross riders at Team Transport and the Murphy’s Creek Trail Ride coming up on 20-21 June 2015. 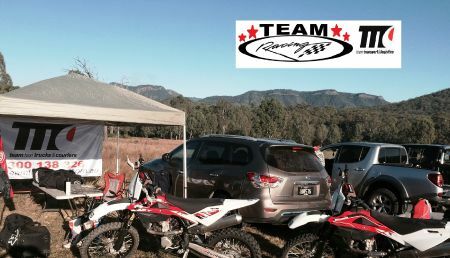 Our boys Josh, Heath and Lindsay were out and about this long weekend at the Rosevale Church country trail ride and it’s great to see them participate in such an active sport. I can recall one of the boys once saying that after a day out on the bike it felt as though he had done twelve rounds with Lennox Lewis. I can only imagine how tough it is.. not to mention how scary it can be if there are injuries. 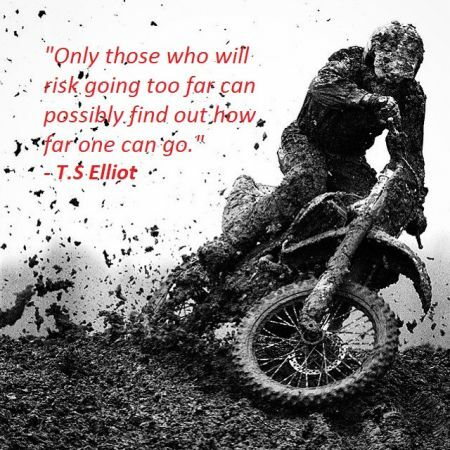 But boys will be boys and I know how passionate they are about their bikes and also leading an active lifestyle. I laid eyes on our Warehouse Manager Josh this morning and see he had a slight limp so knew he must have had a big day so he gave me a brief run-down of the ride yesterday. We arrived around 7:30am just as the gates opened, set up camp for the day and then had a safety briefing around 8:45am. We proceeded to run the short loop very tight to warm up and then we ran the medium loop which was super tight and tricky (BOY WAS IT ROCKY)! Well and truly settled we took on the 18km open loop which had demanding steep climbs, ridges and mountains and challenging descents. True blood, sweat and gears! We all arrived back in one piece as a Team and had lunch, hydration and a chin wag about the ride so far. By the time they opened the quad track we were all pretty buggered but I couldn’t help myself so persuaded the boys to run the quad track into the medium loop and then call it quits, pack up and go home. We ran the Quad and Heath our Operations Manager had a bit of drama on one of the hills so we gave him a hand and he was off and flying but soon after blew his back tyre and his day was done. The rest of the crew took on the medium loop and 5 km into the ride I came up against a dirty mud crossing and put it on the back wheel and the bike slipped under me. I hit a mound at about 50km and I went head first flying over the bike and felt a shocking blow to my knee. Wasn’t a pain free exercise deciding to take on the quad after all. I laid there for about 10 minutes in agonising pain until other riders stopped to help. When I finally felt alright to move and got some movement back in my leg I toughened up and the boys helped me back on my bike. We took it easy back to camp over the next 8km of rugged terrain (let me say it’s bloody hard to hang on with only one leg; I couldn’t use my back brakes so I hung on for dear life lol)~! We eventually made it back straight to the first aid tent and settled myself enough to see I had landed on a rock which edged itself between my knee cap and knee, so thankfully not broken or needing serious medical attention; just sore and sorry for myself. No rest for the wicked though, I am back at work today doing what we do best even though I am hobbling around like an old man. Not sure if I would ever be brave enough to do what they do but admire that our boys have the dedication and passion to do what they love. Good Luck in the Murphy’s Creek Trail Ride! 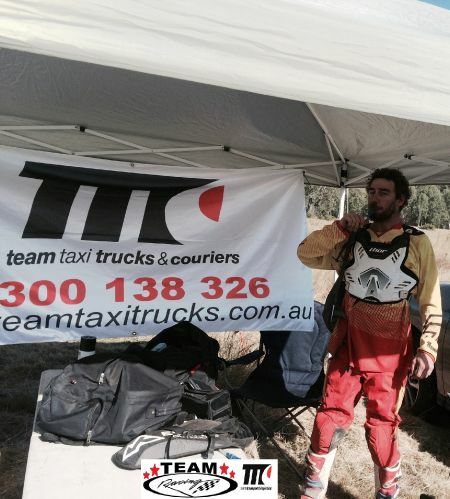 And Team Transport are very proud to be supporting the event. (Pics and story to come for the Murphy’s Creek Ride).